It should come as no surprise that adidas has decided to take their up and coming asset and start to let his larger than life personality start to expand off the pitch. While Messi has never been the type of player that adidas could market as being aggressive, showboating, or in touch with modern music/fashion, Paul Pogba doesn’t have the same issue. There might not be any player on the world’s stage that is the type of person that lends themselves so easily to advertisement outside of a retired David Beckham and Real Madrid’s CR7. Adidas decided to move quickly with Pogba, and we now have a full signature collection that starts on the pitch and ends on the street. The most notable pieces have to be the footwear, with the ACE 17+ PureControl getting the black/gold splash detailing that defines this collection. 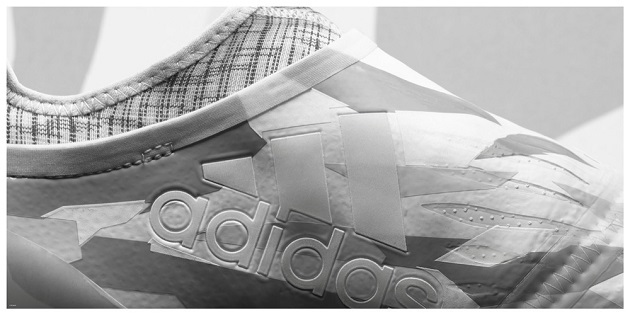 Complete with the “POGBOOM” labels on the heel, it’s a bold look for a bold player. 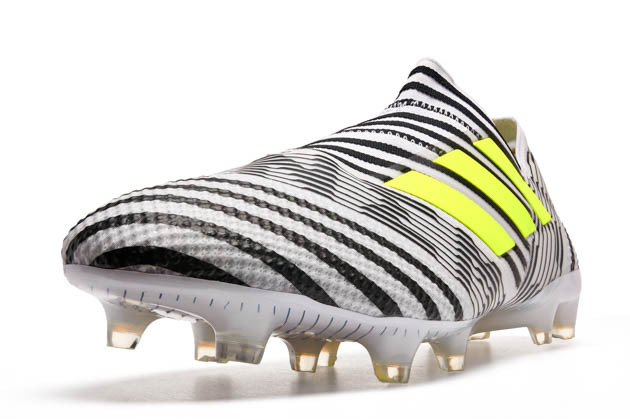 Depending on how many adidas releases in both the FG and Boost versions, these could be a hot commodity that is available for about the time it takes the Frenchman to execute the dab. 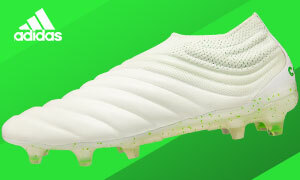 While we love the look, it feels like adidas merely reworked their snakeskin style upper with colors we’ve already seen them outfit Pogba in…we’d gladly take a pair, but we’re already looking forward to the next iteration of Pogba’s collection in terms of something truly original hitting the airwaves. 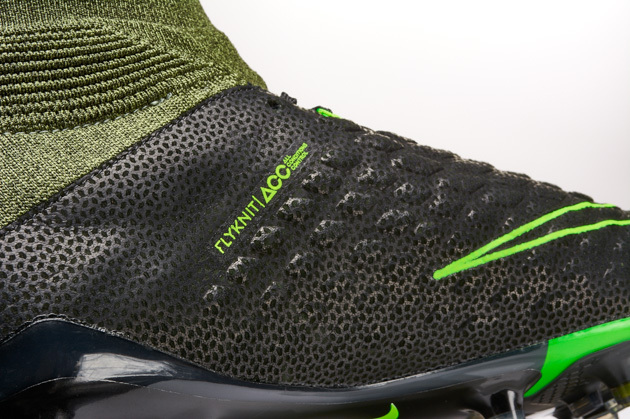 The last two items that might be used on the pitch would have just as much business getting set on your mantle or being worn off the pitch. An absolutely class-filled black adidas ball and kit will be available with the collection, and the ball might be the best item of the bunch. 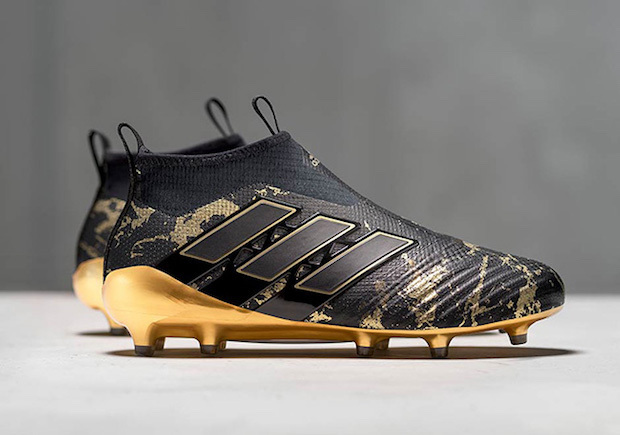 Almost completely blacked out with only the adidas and “PP” logo in gold, it would almost be a shame to kick this…but we’d suffer through. The kit is tailored to Pogba with “Paris” emblazoned on the chest, the Pogba logo taking the place of the crest, and with the same black/gold look that is found on the Pogba boots. Stepping away from the pitch, we find a t-shirt and bomber jacket that would upgrade anybody’s closet in a serious way. The bomber jacket appears to be blacked out, but the liner has the black/gold pattern that the rest of the collection sports. 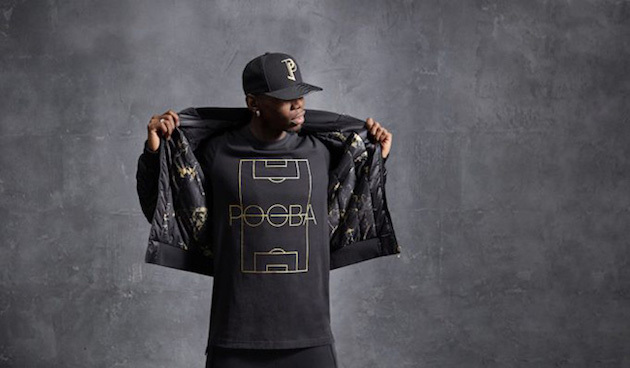 The t-shirt is on a black base with the outline of a pitch drawn out in gold, with the name “POGBA” emblazoned right in the middle. It won’t be for everyone, but there’s definitely going to be a huge fan-base that tries to snag the whole collection.